You only thought Sweden made intensely gorgeous women, and novels about girls with dragon tattoos? Well move over England, Germany, and the entire Asian continent because Sweden is dishing up some candy and they aren’t holding back the excellentness. So Jonny and I went through the site and picked out 10 that looked good and Artin sent it all in just a few days time. He sent about 1kg, @2.2 lbs, and the total price with shipping (to us in California – and they’ll send anywhere in the world) was about $28. So it isn’t cheap but it’s not that bad either. We got a lot of candy that we split in half. I’m still eating some, so it lasts. And of course if you want to buy goods from around the world, well you gotta be ready to throw down a bit. The long and short of it is that Jon and I both agreed the candies were overall awesome and well worth the price and we’ll be buying more. I’m reviewing three types here and Jon will do a few of his own. For me, there was only weak one in the bunch. The Cola and salt candy that had the consistency of Haribo’s Bumix. Taste was good – the consistency not so much. But other than that? I’d eat everything again. The first are Brio Frukt, chicklets size, maybe a little thicker and more square shape. The flavors are original, subtle and good. I can’t quite tell exactly what they are but I’d guess that white is vanilla fruit, red is cherry, green is like a mango citrus, orange is like orangina, and yellow is something but I ate it too quickly and now I’m out! These kinda are the texture of a harder, more dense starburst. Much smaller and way chewier. 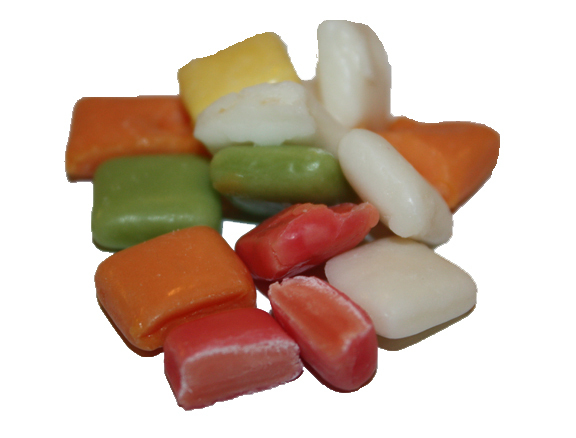 When I pop them in my mouth, it feels like it’ll be a fast eat but they don’t break down very swifty, like a good taffy. I wish I had more of these. I could eat millions. The Hallon Lakrits Skallar, red and black skulls, are half fruit and half licorice. Something I love. You may have had things like this before, such as Haribo’s Vampires which I love though Jon didn’t. The Swedish skull version is way better though. In fact, they are outstanding. They literally out-stand other versions. Here’s why: For one, the piece is bigger. Two, the licorice is salty which goes great with the sweet fruitiness; the Haribo version has no salt. Three, these are loose chewy on the bottom with the licorice but harder chewy on the top with the red gummi, which is a great mix. I didn’t give these enough time to age though, and I bet they age better than Andie McDowell. Which is saying A LOT. Have you seen her lately? She’s at least 50 and hot as hell. 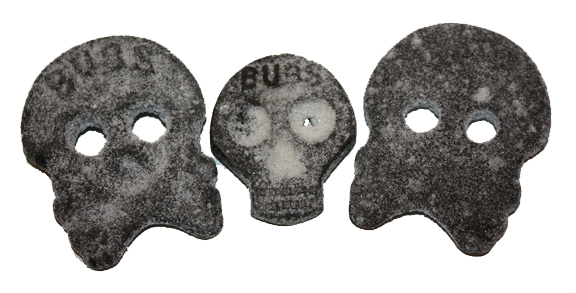 These next licorice skulls are unruly. Look at them. “Saltskallar”: Candy that actually looks scary. I’ll take 6. Please. And all that white powder? It’s either salt or sugar or acid or all three. I simply can’t tell. Lick it straight, and it’s powerfully sweet, sour and salty all at the same time. And the licorice? It’s strong with this one. I threw an entire piece in my mouth and almost gagged. But when I bite off little bits – it was simply delightful. It has that iodine-like finish as the Europeans are wont to do with their licorice, but it isn’t too much. The salt is the perfect amount too, as long as you like salty. If you don’t like salty licorice, then stay away. 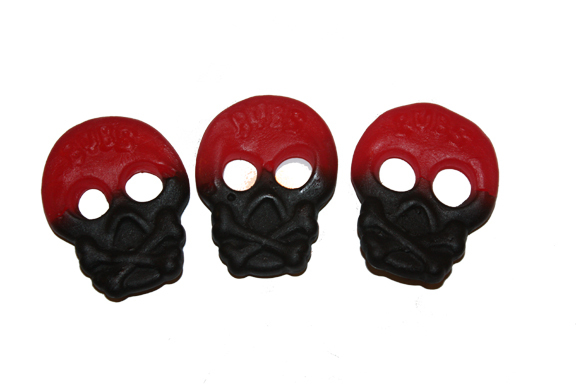 I simply love how these taste how they look – that the menacing skull is reflected in the candy itself. A+. This review is lacking in pictures of Swedish bikini models. I am at a loss to understand why. But good review! Those skulls are scary….